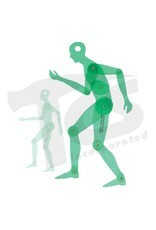 Movable Human Figure Template 13"
Home / Movable Human Figure Template 13"
Available in two sizes. This movable figure allows many positions to be viewed with the proper proportions. Ideal for sculptors working with the human figure.